Keratocystic odontogenic tumour: A diagnostic dilemma? The odontogenic keratocyst (OKC), a clinically aggressive cyst with high recurrence rate, mitotic activity and epithelial turnover rate, due to its clinical presentation it is termed as keratocystic odontogenic tumour (KCOT). KCOTs are usually solitary lesions. Most common site is the mandibular molar region associated with an unerupted tooth. 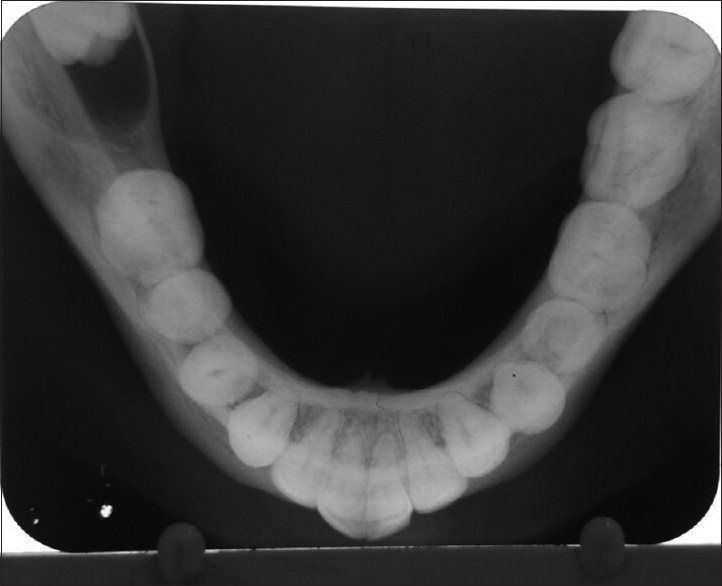 A 26-year-old male patient complained of pain in the lower left back tooth region since 3 days. Pain was gradual in onset, moderate in intensity, intermittent in nature, aggravated on drinking cold water and on swallowing, relieved by itself. Patient's medical and family history was not contributory. Patient underwent extraction in the lower left back tooth region 3 years back which was uneventful. On intraoral examination a diffuse intraoral swelling [Figure 1] roughly oval in shape was seen surrounding the crown of a partially erupted tooth with respect to (wrt) 38, measuring approximately 1 × 0.7 cm, extending anterioposteriorly from the distal aspect of 36 up to 0.5 cm in front of the retromolar area, mediolaterally involving the lingual and buccal aspect of edentulous arch in regards to (irt) 37 and 38. The swelling appeared erythematous. The swelling was soft, fluctuant and tender on palpation, there was no discharge seen from the swelling. Based on the clinical presentation a provisional diagnosis of pericoronal abscess wrt 38 was given. Infected dentigerous cyst and an infected residual cyst were considered as differential diagnosis. Aspiration yielded a yellow colour fluid mixed with blood. Intraoral periapical radiograph [Figure 2] revealed a horizontally impacted tooth, with a well-defined unilocular radiolucency measuring approximately 3 × 3 cm seen surrounding the crown irt 38, extending anterioposteriorly from the distal root of 36 up to the middle third of the root irt 38, superioinferiorly from the occlusal level of 38 up to 1 cm above the inferior border of mandible. The internal structure appeared completely radiolucent, surrounded by a well-defined corticated border [Figure 3]. Occlusal radiograph [Figure 4] showed mild cortical expansion on the medial aspect of 38. 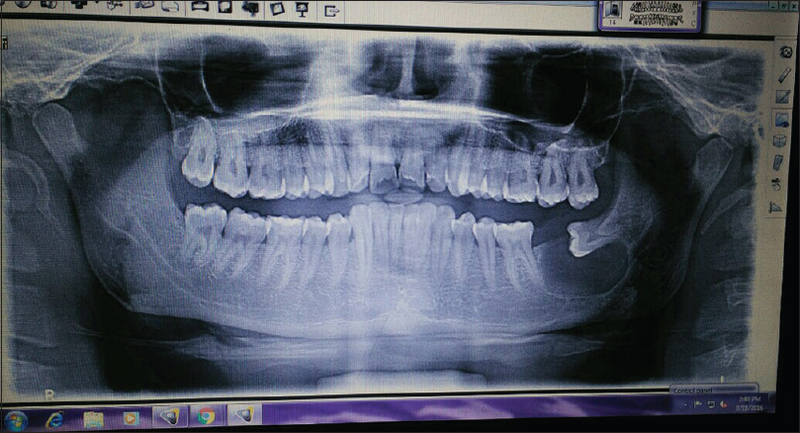 Based on the radiological features infected dentigerous cyst was suspected. Apart from that KCOT was also considered. Routine blood investigations revealed normal values. Excisional biopsy was planned and sent for histopathological examination [Figure 5]. The socket was then sutured and the patient has been for a follow up of 15 months and is asymptomatic. Microscopic examination showed cystic lumen lined by epithelium and fibrous capsule. The cystic epithelium revealed corrugated parakeratinized stratified squamous epithelium 6–8 layers thick. The nuclei of the basal layer were hyperchromatic and demonstrated palisading arrangement [Figure 6] and reversal of polarity in few areas. On the basis of clinical, radiographic and histopathologic features a final diagnosis of keratocystic odontogenic tumour was given. OKC is one of the most aggressive odontogenic cysts owing to its relatively high recurrence rate, commonly seen in second and third decades. Distinctive clinical features include a potential for local destruction and a tendency for multiplicity, especially when the lesion is associated with nevoid basal cell carcinoma syndrome (NBCCS) or Gorlin–Goltz syndrome. In addition to multiple KCOTs, NBCCS is also characterized by nevoid basal cell carcinomas, multiple epidermoid cysts, bifid ribs, calcification of the falx cerebri, frontal bossing, and medulloblastoma. Toller (1967) suggested that epithelial linings of OKCs had intrinsic growth potential and was the first to suggest that there was some basis for regarding them as benign neoplasms. Later, Ahlfors et al. (1984) also proposed that OKC should be considered as a benign cystic neoplasm because of its distinctive features like local destruction and high recurrence, the basal layer of the OKC (KCOT) showed budding into connective tissue and inactivation of PTCH (“patched”), a tumour suppressor gene, which is also seen in NBCC. OKCs appear as small, round or ovoid, radiolucent areas with distinct sclerotic margins. Many are unilocular radiolucencies with a smooth periphery. Some of the unilocular lesions have scalloped margins and are misinterpreted as multilocular lesions. In some cases, curved internal septa may be present giving the lesion a multilocular appearance and may be misdiagnosed as ameloblastoma but the later has a soap bubble or honeycomb pattern. When in a pericoronal position a KCOT may be indistinguishable from a dentigerous cyst. 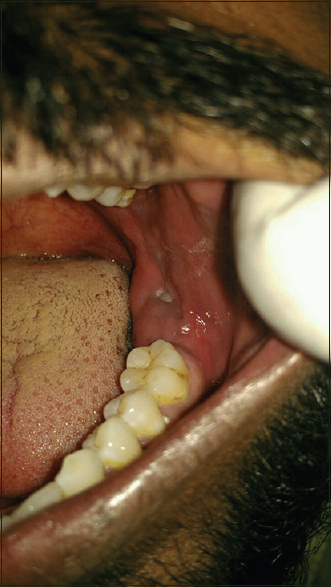 The lesion is likely to be a KCOT if the cyst outline is connected to the tooth at a point apical to the cementoenamel junction. On histopathology, the epithelium shows 6–8 cell layers with wavy parakeratotic epithelial cells; described as corrugated parakeratinized epithelium. The basal layer shows palisaded hyperchromatic columnar to cuboidal cells often described as “picket fence” or “tomb-stone” appearance with keratinaceous material in the cystic cavity. Morgan and colleagues categorize the surgical treatment methods for KCOT as conservative which includes enucleation, with or without curettage, or marsupialization which preserve the anatomical structures, but have a risk of higher recurrence rate and aggressive treatment which includes peripheral ostectomy, chemical curettage with Carnoy's solution or en bloc resection. Recent studies have shown possible treatment modalities for KCOT, such as cyclopamine, a plant-based steroidal alkaloid, which inhibits the cellular response to the sonic hedgehog (SHH) signal activity. Zhang et al. postulated that antagonists of SHH signaling factors could effectively treat KCOTs. They suggested that intracystic injection of a smoothened (SMO) protein antagonist has the greatest potential as a future treatment option. The average reported recurrence rate ranges from 30% to 62%. The presence of residual epithelium after the treatment is one of the contributing factors for the high recurrence rate. KCOT linings are very thin and fragile and are therefore more difficult to enucleate than cysts with thick walls. A long-term follow up of 5–10 years is recommended. Since KCOT has features similar to those of dentigerous cysts, which is a common provisional diagnosis for KCOT, the best way to diagnose KCOTs is to combine clinical, radiographic features and histopathology to provide appropriate treatment and thereby preventing recurrences. The clinician should evaluate cases of KCOT for the presence of the Gorlin–Goltz syndrome which was absent in this case. Most recurrence takes place within 5–7 years after treatment. Hence a long-term follow up plays an essential aspect of KCOT treatment plan. Shear M, Speight P. Cysts of the Oral and Maxillofacial Tissues. 4th ed. Copenhagen, Denmark: Munksgaard Wiley-Blackwell; 2007. Grasmuck EA, Nelson BL. Keratocystic odontogenic tumor. 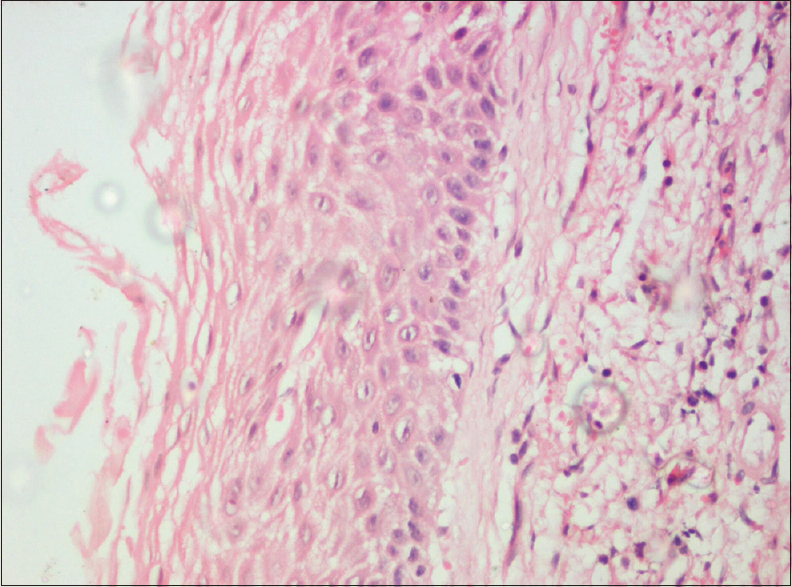 Head Neck Pathol 2010;4:94-6. 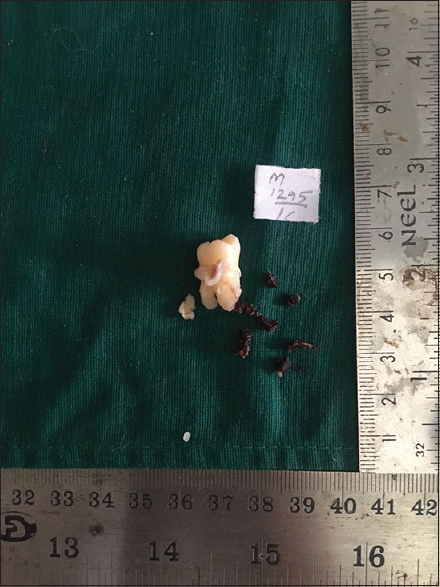 Rajkumar GC, Hemalatha M, Shashikala R, Sonal P. Massive keratocystic odontogenic tumor of mandible: A case report and review of literature. Indian J Dent Res 2011;22:181. Madras J, Lapointe H. Keratocystic odontogenic tumour: Reclassification of the odontogenic keratocyst from cyst to tumour. Tex Dent J 2008; 125:446-54. Zhang L, Sun ZJ, Zhao YF, Bian Z, Fan MW, Chen Z, et al. Inhibition of SHH signaling pathway: Molecular treatment strategy of odontogenic keratocyst. Med Hypotheses 2006;67:1242-4.